Professionals:	Bersoft Image Measurement is a convenient image measurement for scientists, engineers, biologists and medics. IT Staff: HTMLPrint manages easily HTML printing tasks on the background. It is useful for dietary strategies building mediterranean diets based on AHA, RESMENA and other similar diet systems. It provides useful graphical guides for building excellent personalized diets and also it is useful for building new and personalized recipes with nutritional facts label based on the FDA requirements. Nutrigenic Helper is designed for managing custom personalized diets for treating, controlling and preventing nutritional health issues such as metabolic syndrome, obesity, overweight, and diseases risks associated with nutritional conditions such as diabetes and cardiovascular diseases. Plan calories builder and calories restriction calculations features are available as well, to manage weight gain during the pregnancy, recording biochemical tests and physical activities calculating their energy consumption. Bersoft Image Measurement is an application for measuring digital images. To measure an image, simply click on the image to define control points. The program will automatically calculate the area, perimeter, angle, radius, or length, depending on the measurement tool that is selected. It can analyze Elisa and Western Blot arrays or whatever kind of images arranged in grids you may have and also supports pixel profiling and object analysis. The program can read PNG, JPEG, TIFF, and many other image formats. Although Bersoft Image Measurements performs all measurements in pixels it can convert automatically the pixel values to any other measurements unit such as millimetrs, microns, feet, miles, etc., by using a Conversion Factor that can be easily set by the user. Utility for printing HTML pages in an invisible way, called from other application, either passing the page to print or a file list as a command line parameter. Also can monitor a directory for incoming files in order to print them. Printing can be done in different ways: 1. By batching documents as retainable lists which can be automatically printed in document sequence of your choice. 2. By sending the file or directory name to be printed as a command line parameter to HTMLPrint the file or HTML files inside a director will be printed in an invisible fashion. 3. Using Directory Monitoring. HTMLPrint runs in the Windows Task Bar watching continuously a folder for incoming HTML (or image) documents and printing them. Bersoft Image Measurement (BIM) is a powerful image asset management application that makes it easy to acquire, measure, store, compare and analyze digital images. BIM performs image analysis functions that include gray scale and 24 bits color measurements: angle, distance, perimeter, area, point, line, pixel profile, object analysis, histogram and statistics. It also supports Pixel Profile and can analyze dot blots and other basic arrays. BIM supports DICOM, JPEG, TIFF, PNG, and many other popular image formats. Images can be shown in a variety of ways, including viewing histograms from partial or complete images, generating false color images, subtracting image backgrounds, merging images, inverting image colors, manipulating channels applying filters, and adjusting features such as gamma, brightness, and contrast. BIM also supports, Pixel profile, Charts, Object counting, Macro measurements and exporting as PDF files, between other features. It can analyze Elisa and Western Blot arrays or whatever kind of images arranged in grids you may have. It has a very accurate automated spot finding features. BIM can run as a Portable Application on a USB Drive. Batch Scan Plus (BSP) is oriented to scanning a chapter or a long series of documents or when you need to deal with files from a digital camera. Because it treats the series of pages as a set. Scanning two pages at once is easy since BSP rotates and saves each scan as two files, and keeps the numbering right too. All these apps run on Windows 10, 8, 7, Vista and XP (32/64 bit). 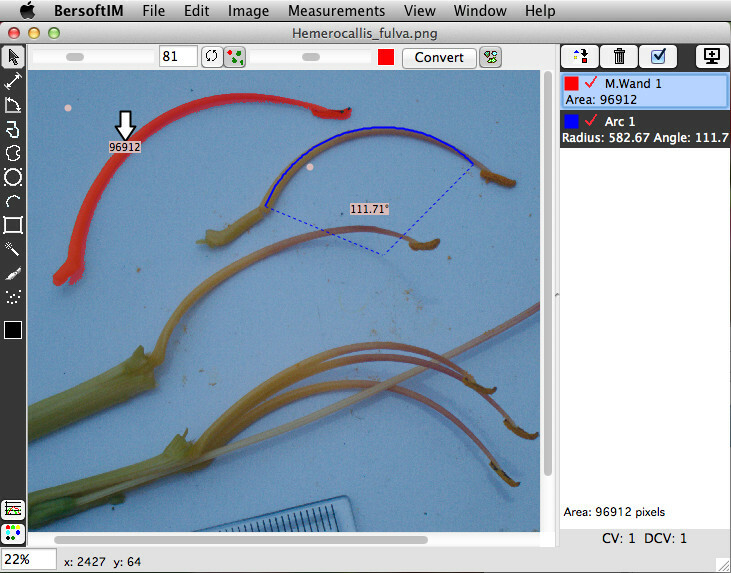 Bersoft Image Measurement runs on Mac OS/Linux as well.